Dubai (AFP) – Saudi authorities have widened a crackdown on women’s rights advocates, detaining at least three more activists a month before the kingdom lifts its decades-old ban on women drivers, campaigners said Tuesday. Saudi authorities on Saturday announced the arrest of seven people, mostly identified by rights groups as women who have long campaigned for the right to drive and to end the conservative Muslim state’s male guardianship system. Amnesty International told AFP the number of detainees has risen to 10, including at least seven women, while the Gulf Centre for Human Rights and another Saudi activist said the number stood at 12. “Despite international outcry and calls for the release of these activists, they still remain detained for their peaceful human rights work,” said Samah Hadid, Amnesty International’s Middle East director of campaigns. The detainees include three generations of activists such as 28-year-old Loujain al-Hathloul — who was also held in 2014 for more than 70 days for attempting to drive from neighbouring United Arab Emirates to Saudi Arabia — and Aziza al-Yousef, a retired professor at Riyadh’s King Saud University. Also arrested, campaigners say, was Madeha al-Ajroush, a psychotherapist in her 60s, well known for being part of a group that mounted the first Saudi protest movement in 1990 for the right to drive. The Gulf Centre for Human Rights voiced concern that Hathloul, one of the most outspoken activists, was being held incommunicado, while other campaigners said the detainees were without any access to lawyers and their whereabouts were unknown. Saudi government officials did not immediately respond to requests for comment. Without naming those detained, authorities have accused them of “suspicious contact with foreign parties”, providing financial support to enemies and attempting to undermine the kingdom’s “security and stability”. State-backed media branded them traitors and “agents of embassies”. The crackdown has cast a shadow on the kingdom’s much-publicised liberalisation drive launched by powerful Crown Prince Mohammed bin Salman, who recently undertook a global tour aimed at reshaping his kingdom’s austere image. “It is clear that underneath all the PR hype and spin, Crown Prince Mohammed bin Salman’s reforms exclude human rights activism,” Hadid said. In a scathing statement, the New York–based Committee to Protect Journalists demanded the release of detainee Eman al-Nafjan, a linguistics professor and mother-of-three who ran the popular “Saudiwoman” blog. “Crown Prince Mohammad Bin Salman recently toured the West to project the image of a modernist and reformer,” CPJ deputy executive director Robert Mahoney said in the statement. Those arrested had campaigned for the lifting of the driving ban and also against the guardianship system requiring women to obtain permission from their fathers, brothers, husbands or sons for a host of life decisions. “The kingdom’s small community of liberal activists is reeling and struggling to make sense of the events,” the Washington-based Project on Middle East Democracy said in a report titled “Saudi Arabia: No country for bold women”. Featured Photo: AFP/File / FAYEZ NURELDINE. 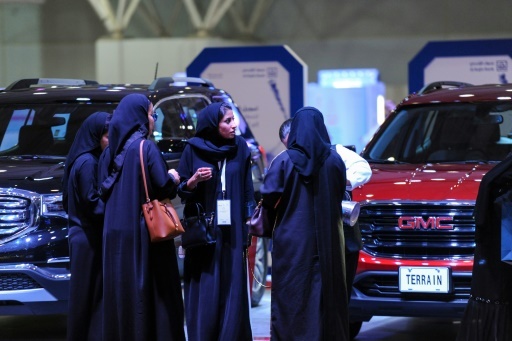 Saudi women check out cars at an automotive exhibition for women in the Saudi capital Riyadh on May 13, 2018.